Download the complete Product Guide that accompanies this episode! t of our annual spring gear guide. On last week’s episode, Kate Dunbar schooled us on stocking our camp kitchens. Now it’s our turn to fill in the rest of the RV cabinets and cupboards. We will share items that make your walls a little prettier, your campfire a little cozier, and your beds a little comfier. That just about covers it in our world. Plus, Brett Neilson is back with his favorite picks from the 2017 Outdoor Retailer Winter Market. A curated set of 4 Cutco knives with sturdy sheaths, designed to take care of all the cutting and chopping you may have to do while traveling in your RV. The custom set includes the hardy slicer, 5″ Petite Santoku Knife, Traditional Cheese Knife, and 4″ Paring Knife. This custom 4-knife set with sheathe is only available through Stacy’s online website, where she will give RVFTA listeners the special pricing! A set of four nesting bowls in fun retro colors with tight-fitting lids. These will join our Camp Casual 12-Piece Dish Set and Serving Bowl in the RV this season. These solar light lids fit onto standard mason jars and are absolutely adorable sitting on the picnic table at the campground. 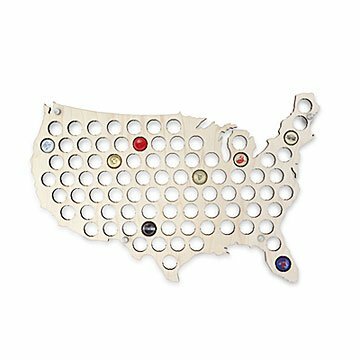 This bottle cap map is already hung on the wall in our new camper, just waiting to be filled with craft beer bottle caps from all around the country! Another new decoration for our RV. We are excited to scratch off the states as we visit them in the future! Stephanie ended up with four of these shirts with fun graphics about camping and the outdoors. They are on sale for $14.99 right now, and that is a bargain for a quality t-shirt from Cabela’s. Stephanie needed waterproof hiking boots, and this Gortex option from Cabela’s hits a great price point. The color is also guaranteed to cheer you up on a rainy day. Again, there is a Spring sale right now over at Cabelas.com, so you can snag these for as low as $80.00. It was long overdue for us to acquire a portable power bank, and we are so happy that our research led us to this affordable option. With two USB ports, we will both be able to charge up even when away from shore power for an entire day. The National Park Service Campgrounds are notoriously tricky to research, and this book is a big help. This is Jeremy’s Nimbus 2000 doggie leash setup. He gets razzed a lot for it, but having a retractable leash with light and attached doggie bags has proven to be convenient more than a few times over the last year. In addition to a retractable leash, we always carry a standard 6-foot leash in the camper. This affordable one offers illumination for late night walks. Jeremy has been searching for a lightweight hiking pant that will translate into real life situations as well. He finally found one. Jeremy had a similar sweatshirt in the past that was perfect for Spring and Fall temperatures. This Cabela’s version is even better than the one he had since it is fully lined through the arms. For a handy-dandy, quick reference guide to all the products reviewed in this episode, download our Product Guide! A special thanks to our sponsors who support weekly RV content for all our RV fools! Thanks for the shout out! You guys are awesome and Stephanie, it was a pleasure to hang out and sharpen your knives! I love, love, love my new set of RV knives. Thanks, Stacie!! !